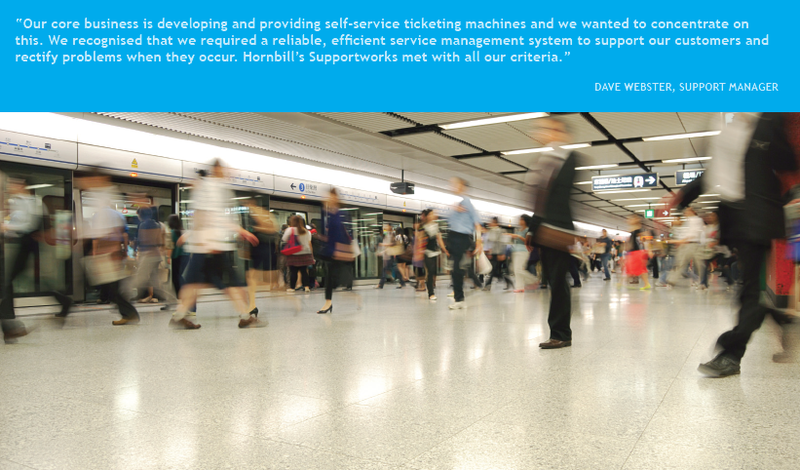 Shere Booking and Ticketing Systems was founded in 1992 by its Directors Neil Briscoe and David Parson, with a vision of a self-service future for ticketing machines. Shere is now market leader with over 1200 self service machines and desktop machines installed, nearly two-thirds of the total UK market. 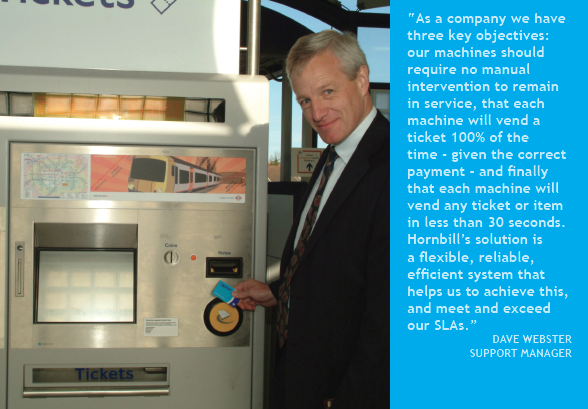 Shere pioneered and developed the FAST range of self-service ticketing systems that are found in most railway stations in the UK. They supply bespoke machine versions to over 26 train operating companies and airlines, as well as specialist self-service reception kiosks for hotels. Ensuring that its client machines are operational is a top priority. For Shere’s clients, being able to provide tickets and handle payments is a critical part of their business – Shere’s machines account for almost a billion pounds’ worth of clients’ business annually. If a client’s ticket machine goes down then this can mean significant loss of revenue, for all the time that the system is not working. It is vital that Shere can quickly identify potential problems and deal with them efficiently. Shere invested in Hornbill’s Supportworks service desk management system to record, track and resolve such issues. Supportworks is used by Shere to automatically capture, log and allocate problems to the service desk team, many of which are raised by the machines themselves. The software is used by over 16 support desk engineers to track calls at the support centre located in Guildford. The team are supporting more than 1200 machines installed at client sites nationwide. The machines connected to clients’ own local networks use VPN technology to allow the machines to communicate directly with the support centre systems. Supportworks automatically alerts problems to Shere’s support team, which may be anywhere in the UK, from Aberdeen to Plymouth. The team either rectifies the problem remotely or if it requires a physical, hardware repair, an area supervisor is alerted who will contact the relevant engineer. The customer support team resolves 60-70% calls remotely, and over 50% calls are rectified on first contact. When a call cannot be resolved, the area supervisor is contacted who can access the details via a handheld PDA and send the location and nature of the problem to the nearest engineer. Once the support engineer has rectified the problem, he will then update and close the call remotely. A key driver for Shere was being able to optimise its ability to meet and exceed its stringent Service Level and contractual obligations associated with each customer contract. The SLAs are specific to each client, with an SLA matrix automatically determining the severity, chargeability and regional allocation. It is important that any problems that arise with the machines are dealt with quickly, to avoid sometimes significant financial penalties being incurred by Shere for not meeting its agreed SLAs – Supportworks enables the IT team to do this. Supportworks’ open architecture also enables easy integration with a client system monitoring solution, Insight. Insight provides a traffic light system (green, amber and red for critical) that alerts Shere to machine status, that is also linked to the Hornbill system. Shere’s customers have access to this system which also collects data from Supportworks, so that customers can check the status of any faults logged or rectified. With Supportworks, Shere is able to log and track every call and generate reports which have been invaluable for trend and problem analysis. Performance reports can be produced for clients, of which 70% of the data used is obtained from Supportworks.